Mark: The Weight of a Piano takes place in several places, Russia, California and other locales. How important is place in your writing? 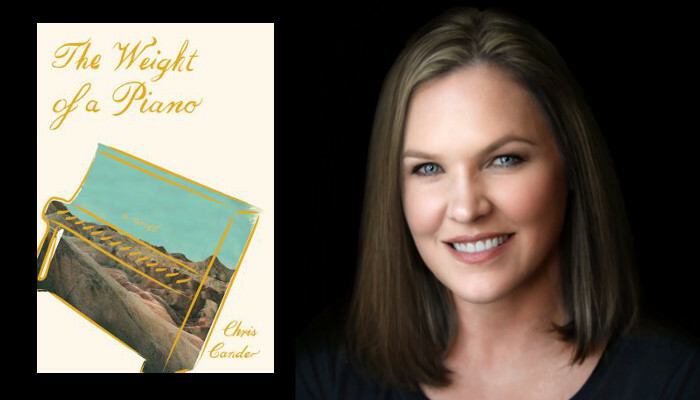 Chris Cander: Although my work is typically inspired by the idea of a character or a situation first, the setting announces itself almost immediately thereafter. Place is more than mere physical backdrop for a narrative; where (and when) a story unfolds is an essential and inexorable part of its shape. My favorite novels are those in which the author invokes the spirit of a place so well that the drama couldn't have happened anywhere else. I can't think of Michael Ondaatje's, for example, without also visualizing the Italian monastery Villa San Girolamo and the Libyan desert, or Adam Johnson's The Orphan Master's Son without Kim Jon Il's North Korea, or Barbara Kingsolver's The Poisonwood Bible without the Congo, or anything by Charles Baxter without the American Midwest. In my own work, I'm compelled by the relationship my characters have with the world around them: how their psychologies are informed by their geographies, whether they feel at home or out of place, how they engage with or rebel against a particular locale. After I've chosen a setting (or settings) for a novel, I try very hard not to render these places but to create them. I hope that readers feel that The Weight of a Piano couldn't have taken place anywhere but an oil town in California, Soviet Russia, and Death Valley National Park. MH: Many of the relationships and events in The Weight of a Piano have a lot to do with fate and coincidence. Are you a big believer in these in real life? CC: As romantic as the idea of fate can sometimes be, I can't say I believe anything in life is actually fated or predetermined by a supernatural power. Instead, I think our futures are causally determined by what we think, say, and do. If, for example, the exact piano we've been hoping to find happens to finally show up on an online auction site, is it fate? Or is it that we've been scouring the Internet and have set up keyword alerts and are constantly checking for updated listings? In the case of my meeting the woman who accidentally gave me the idea of The Weight of a Piano by mentioning that she'd finally gotten rid of the piano her father gave her when she was a child, was it meant to be? Or was I just desperately watchful for something to inspire my next book project? What looks like fate is probably just people noticing and acting upon the chance opportunities in their lives. Having said that, I love--adore, actually--those goose-pimpling moments that can't be logically explained. Anything synchronistic--the simultaneous occurrence of events that appear significantly related but have no discernible causal connection--feels a little magical to me. For example, my next novel involves a latex balloon traveling across the country. I'd taken a few weeks off from it and was starting to get a little anxious about starting again. The day I decided to resume working, I got two separate texts from friends about balloons. How to explain something like that? I can't. I'd rather take it as an encouraging sign and get back to my desk. MH: I remember you speaking at Brazos for your last novel, Whisper Hollow, and you mentioned how the voices of your characters spoke to you. Is that still the case? Did the characters in The Weight of a Piano speak to you? CC: Interestingly, they didn't speak directly to me the way Alta in Whisper Hollow so clearly did. I feel very close to them, but except for one, the characters all turned their attention inward or to the others, and I had to pay very close attention in order to understand them. The one who wanted me to know her the best was actually the eponymous Blüthner. She let me in right away, and I felt a psychic connection to her even though she doesn't speak and I don't play music. I think it was from a desire to hear her express her emotions that I decided to commission a piece of music by a professional composer (Konner Scott), which became part of the novel. MH: What are some contemporary authors who inspire you or who you just really enjoy reading and wait with bated breath for their new books? CC: Tatyana Tolstaya, Annie Proulx, Valeria Luiselli, Ha Jin, George Saunders, Min Jin Lee, Amor Towles, Elizabeth Strout, James Hannaham, Lauren Groff, Leif Enger, Marilynne Robinson, Laila Lalami, Colum McCann, Chloe Aridjis, Paulette Jiles, Catherine Chung, and many, countless others. I'm especially looking forward to the forthcoming books by two dear friends: Cameron Dezen Hammon's This Is My Body and Mark Haber's Reinhardt's Garden, both due out this October.